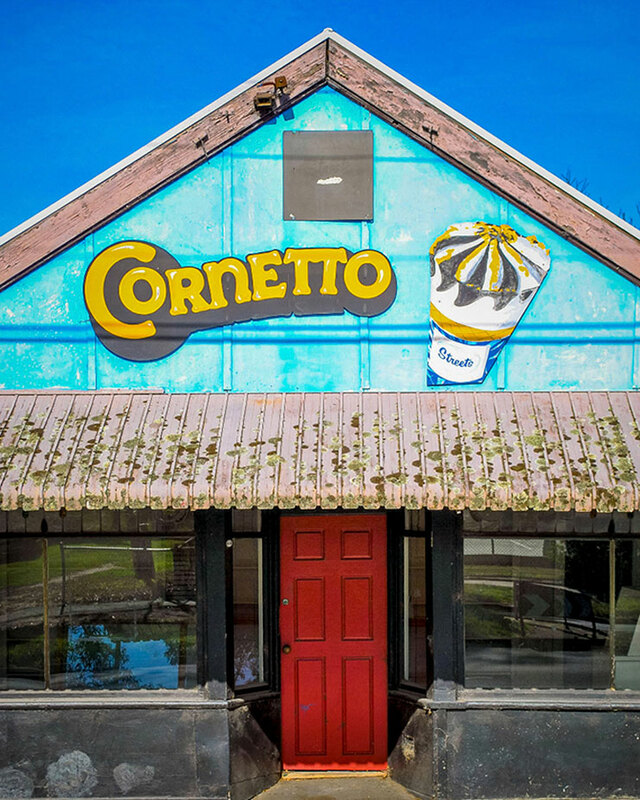 Eamon Donnelly has spent the last 10 years travelling around Australia taking photos of milk bars. Why? Because they’re there. Or at least, they used to be there. In fact, Eamon has taken so many photos of milk bars that he’s self-published a book, The Milk Bars Book—a dusty time capsule, frozen somewhere around 1983, where the lollies are always cheap, the Sunnyboys are frosty, and $5 can buy you approximately seven days’ worth of food. It turns out there’s a lot more to the humble corner milk bar than most people realise. They weren’t just a place to pick up cheap frogs and suspicious dim sims; Milk bars are closely tied to the migrant history of Australia. They date all the way back to 1932 when the first ever milk bar opened in Sydney’s Martin Place. And they’re disappearing all over the country. We sat down to Eamon to discover what makes milk bars special, and why they’ve gone the way of the Blue Heaven Big M (RIP). How did you find all these milk bars? Lots of ways. Sometimes I find buildings just driving around, or I get tip-offs from locals. Google Street View is a good resource. The milk bars that are really well known, they’re easy to find, because people have documented them before. Like Sydney had The Olympia milk bar, which is pretty famous for being a time capsule, one of those traditional 1950s-style milk bars. That closed down last year, and it was pretty much a museum. So things like those ones were easy. So You’ve Gone National With The Project? Yeah, the book’s got every state covered. Every capital city is in there. Canberra was the only place I couldn’t find a good milk bar—I had to use archival footage for that one. What’s interesting is there’s some regional variation with milk bars. In Perth and South Australia, they actually call them ‘Delis’ and ‘Lunch Bars’ and ‘Snack Bars’. Turns out ‘milk bar’ is a sort of east coast term. Melbourne has the most, but they’re mostly corner shops here. So What Makes A Classic ‘Milk Bar’? Well, a traditional ‘milk bar’ was literally a business that sold takeaway milkshakes, sundaes and chocolate. It was based on the old American soda bars. The first one opened in Sydney in 1932, in Martin Place, and it had that art deco interior, mirrored walls, a few booths, you know. Back then we had the 6 o’clock closing time for pubs, so people would go out after work and have a milkshake. It was crazy popular at the time: more than 3000 milk bars opened up within a few years in the 30s, all over Australia. Then the corner stores saw the popularity of this idea, so they started doing it too. Over the years, the model got picked up, and it became that shop on the corner where you could get milk, cigarettes, the papers, the lollies. That became the Aussie milk bar. What happened to most of these places? Most corner milk bars in suburban areas have turned into cafes, or maybe residential developments. If they’re heritage listed, and a lot of them are, you’ll see they have to protect the façade and the old awning. Unfortunately, the milk bar hasn’t really been able to survive. Supermarkets and servos have taken the milk, the bread, even the newspaper away. Back in the old days, a lot of people didn’t have a car, even up until the 1970s, so the corner milk bar used to service a couple of blocks. All the supermarkets used to close at midday on a Saturday, so the only place you could get last-minute supplies was the local milk bar. What’s It Like Meeting The Owners? I have some great memories in the book from owners all over the country. A lot of the time it’s kids who grew up working in their mum and dad’s milk bar in the 60s, 70s and 80s, so they have these great memories of the mixed lollies and serving customers after school. Sometimes translating for their parents too, because milk bars were often the first business for new migrant families. Growing up in Geelong, my childhood milk bar was run by second or third generation Australians. They were Scottish or Irish I think. But in the capital cities, especially on Chapel St and the urban areas around Melbourne, milk bars were mostly run by Greeks, and to a lesser extent Italians. This was up till like the ‘60s or 70s. Then Vietnamese migrants in the 80s started to buy these businesses off the Greek families. The milk bar was that business where you could come to Australia, start a new life and make an honest living so you could send your kids to a good school and university. It’s always been a stepping stone business. How’d You Get Into Milk Bars In The First Place? Well, we lived in one in West Brunswick for a few years, believe it or not. We rented out the back and the old shop was my art and illustration studio. That was the ultimate Brunswick life. It still had a Bex aspirin sign on the door, you know, the old ‘Have a Bex and lie down’. I actually went to the Brunswick Library and got the old Sands & McDougall pages out, and went through and found the address, and it dated back to about 1920 as a confectionary shop. Because I’m a very nostalgic guy, I’ve got this real 80s obsession. So the milk bar was a big part of that, particularly in my childhood. I love the graphics and colours and those old fonts. I started taking a few around Geelong, took more photos on an old Sun600 Polaroid camera. Then I started coming up to Melbourne and doing it here. When they stopped making Polaroid film, I invested in a Nikon DSLR, and suddenly I could take thousands of photos. It just grew from there. What Is It About Nostalgia That Gets People So Passionate? I dunno. It wasn’t necessarily a better time, but it’s natural to think back to those good moments, and what we’ve lost and what we’re losing. I’m a very nostalgic person. I think back to the 80s – it was such a good time to be a kid. It was just rad, and milk bars were a big part of that. That was their last hurrah, the 80s. It started to decline after that. So much has changed so quickly. It’s definitely sad. Want to pick up a copy of The Milk Bars Book? It’ll be hitting the shelves in February 2019. You can sign up for pre-orders here.